This was my children's favorite part! You can see a few other ideas for celebrating the feast of St. Thérèse here. Have a wonderful feast! I love this!! 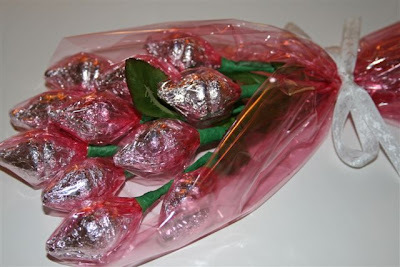 I've seen these candy roses before, but what a great idea for today!!! Unfortunately it's too late for us, "Mary" is sick (with the pukes) so we are going no where!! We might have to do those cute kiss angels though....all we need is the kisses...late night trip for mama I guess! I am so sorry that Mary is sick. I will say a prayer that she is well soon, and the rest of you stay healthy! God Bless! Oh how fun! What a neat idea too! These are amazing, Jessica! You are a tremendous gift to our family.